We have noted here several times that RWE of Germany, one of the 'Big 6' UK power and gas players (in its local guises as NPower and Innogy) is a prime candidate for the bed closest to the door. Iberdrola of Spain (= Scottish Power) is the other, but seems to have stabilised itself of late. News from the bedside is not encouraging. A surge in [German] solar and wind capacity undercut the profitability of its power plants and triggered nearly 5 billion euros in write-downs. The company said on Tuesday it had swung to a net loss of 2.76 billion euros from a profit of 1.31 billion a year earlier, its first net loss since 1949. This is one of the companies the UK government is increasingly beating up on for supposed overpricing, while simultaneously passing round the hat for vast investments towards its demented dirigiste energy plans. Perhaps someone in Whitehall will realise that the three components in this puzzle - pressure on revenues, expectations of huge capital investments, and a sickly balance sheet - do not readily snap together into a neat jig-saw. It won't just be HMG's plans that feel the draught as the door opens for RWE to be wheeled away to intensive care. 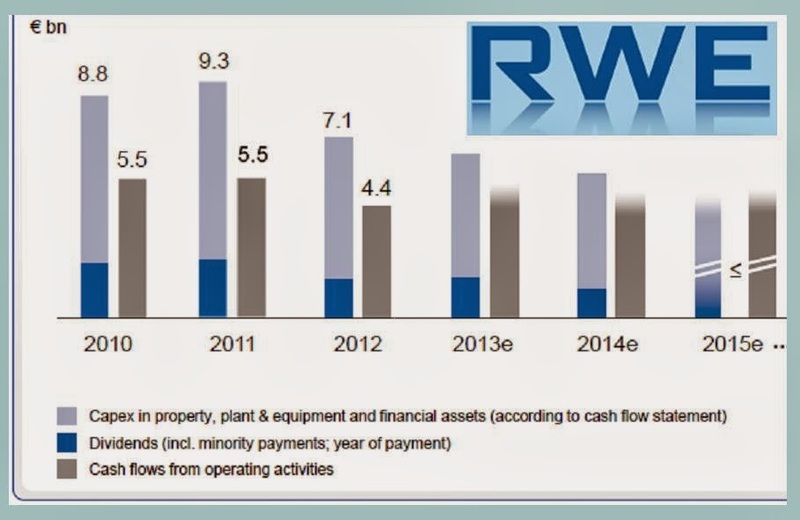 As with its German sibling Eon, RWE's share register is dominated by Stadtwerke, who rely on the hitherto healthy dividends for provision of municipal services. In mighty Essen for example (home to both RWE and Eon-Ruhrgas) the city elders are being forced to contemplate savings such as closing large chunks of the tram network as dividend income falls. 'Utility death spiral' is one of the more dramatic descriptions of what's going on. This, Ed Davey and Ed Miliband, is the real world. You can probably persist with your delusional energy policies for a little while longer. Maybe till after the Election. And then The new Labour govt will triumphantly announce that since the free market has shown itself incapable of supplying cheap clean energy, they are going to have to nationalise the whole thing. Their plan will have worked. and wo betide everyone else. Because of the solar feed-in tariff in DE, RWE have had CCGT plants off-line for some of the summer months. It's not possible to maintain a business model that is subject to the vagrancies of European weather. They also got hit with the withdrawal of nuclear of course and the DE government being unwilling to compensate them. Much of what is happening in DE is mirrored in the UK and we are in as much trouble. Expect energy bills to go through the roof when the full effects of STOR kick in.